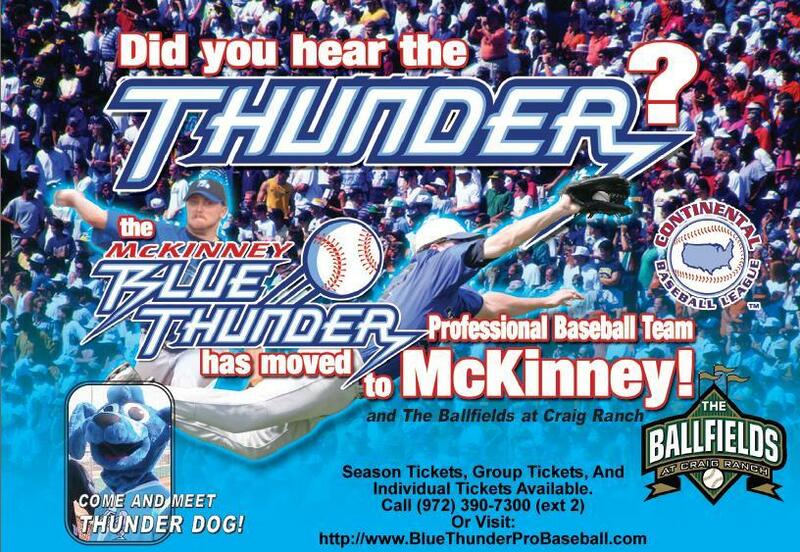 This page is dedicated to the McKinney Blue Thunder independent professional baseball team. It lasted one year, during the 2008 CBL season. Review of Gabe Nesbitt Field (Ballfields of Craig Ranch) from Ballparkreviews.com during the 2008 season. This piece was produced for what would have been the 2009 Dallas Aviators team. While that team did not materialize, the footage was from the 2008 McKinney Blue Thunder including catcher Glenn Wilson. The McKinney Blue Thunder will take on the Texarkana Gunslingers in the first professional baseball game in the history of McKinney today at 7 p.m. at Gabe Nesbitt Field at The Ballfields at Craig Ranch.